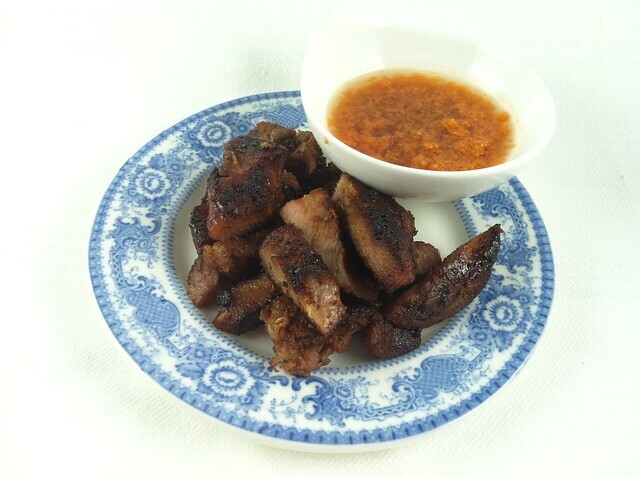 Vietnamese grilled pork, or thit heo nuong (insert Vietnamese characters in there), remains to be one of my favorite Vietnamese dishes. I still remember when my parents and I would eat in Chinatown’s Nha Trang restaurant every week. The dish did not cost much and it always came with a lot of rice; to my family, there was no better deal than that. Even my brother, who now lives in Singapore, makes sure that Nha Trang is still one of his stops when he visits us here in the States. Even though I work a few minutes’ walk from Chinatown these days, I find myself too lazy to shop and eat there unless a specific craving knocks on the door. I recently saw some beautiful pork chops at Fairway supermarket in Harlem and thought about this dish as soon as I picked up one stalk of lemongrass from their produce section. Say what you will about being uptown, but I’m grateful I can find fresh lemongrass when I need it. Lucky you if you have access to an open grill. I used my frying pan here but also my iron grill press to flatten the meat and cook them faster on each side. The caramelized marinade on the pan is great as dressing if you have a bunch of mixed greens to serve as a side–just wipe the bottom of the pan with the leaves! 1. Whisk lemongrass, garlic, honey and nam pla in large bowl. Add lime juice and pepper. Place pork in the bowl and turn to coat. Let stand and marinate, or refrigerate for up to 24 hours. 2. When ready to cook, heat a frying pan with some oil. Add marinated pork chops and fry, turning over to cook the other side every 3 minutes to avoid burning the marinade. Use an iron grill press if handy to cook the meat faster. Remove to a chopping block and let rest. 3. Make the dipping sauce. Combine a few jiggers of fish sauce and vinegar in a small bowl. Add the carrots and mix well. Serve with the pork and some white rice.